The "Great Moscow Circus on Vernadsky Avenue" ("Bolshoi Moscowskiy Tsirk na Vernadskogo" in Russian) was built under the reign of Leonid Brezhnev as First Secretary of the Communist Party of the USSR, and opened its doors on April 30, 1971. It is located on Vorobiovy Hills (formerly Lenin Hills), near Moscow University, at 24 Vernadsky Prospect (Avenue). Built by Yakov Belopolsky—one of the busiest official architects of the Brezhnev era—in cooperation with E. Bulikh, S. Feoksitov and V. Khavin (who may have been more familiar with the technical demands of such a structure), it is, with its 3,350-seat house and its numerous and specialized facilities, the world's largest circus building. Its unique technical fittings make it an exceptional tool for the presentation of all sorts of large-scale circus productions. 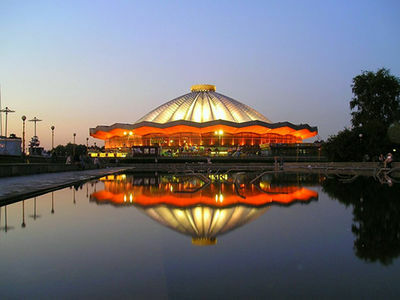 The building includes a rehearsal ring, located backstage, behind the ring entrance, in a space vast and high enough to accommodate a large flying actAny aerial act in which an acrobat is propelled in the air from one point to another. ; a stage above the ring entrance, which can connect to the ring with a giant telescopic staircase that unfolds automatically; the possibility for aerialists to access their apparatus from the ceiling; and several rooms at various temperatures to accommodate the upkeep of exotic animals. But its interchangeable ring is the true jewel in the crown: It is placed on a hydraulic platform that can be lowered into a gigantic basement, in which four other rings are stored around the central elevator.The full-size rings can roll on and off the elevator platform. 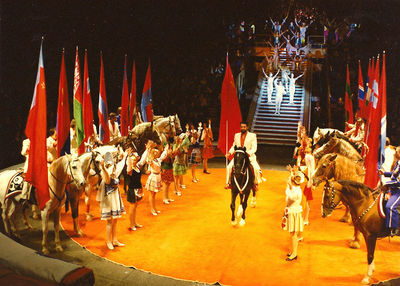 The main ring is a traditional equestrian ring, the first ever to have been covered with a hard-rubber mat, as it is now the custom in Russian circuses. Others are a water basin, replete with underwater lighting and fountains; a hard floor ring with trapdoors for magic acts; a lighted floor ring; and an ice ring. This system allows not only quick floor changes adapted to each specific act, but also gives the possibility to install complicated riggings or scenic elements during the presentation of an aerial act, or of an act on stage. During the Communist era, the Bolshoi Circus was the most prestigious circus of the USSR. From 1977-1983, it was under the management of the famous antipodist(French: Antipodiste, Russian: Antipod) Foot juggler. (foot juggler—and, in this case, foot balancer) Evguenny Milaev, who happened to be Leonid Brezhnev's son-in-law. After a financial scandal that implied Milaev, the circus passed under various managements, until another former star of the old Soviet circus, the perch-poleLong perch held vertically on a performer's shoulder or forehead, on the top of which an acrobat executes various balancing figures. balancer Leonid Kostiuk, was given the reins. Kostiuk remained at the helm after the fall of the Soviet regime in 1991. The building's heavy machinery was conceived with custom systems and elements especially designed for this project, and it became difficult to maintain or fix when needed, since there are no existing replacement parts. Furthermore, the building is located far from Moscow's center, and after the fall of the Soviet regime—and its system of corporate group sales—it had proved difficult to fill to capacity the 3,500 seats of a circus that is particularly expensive to maintain. Although the Bolshoi Circus still offerered circus shows of the highest quality, its old downtown competition, "The Circus on Tsvetnoi Boulevard," today Circus Nkulin, had reclaimed its crown as Moscow's—and Russia's—premier circus. In 2012, however, a change of administrative management at the Bolshoi Circus marked the dawn of a new era, and it came with the beginning of a long-awaited restoration. In 2013, the Russian Ministry of Culture renewed its interest in the circus arts, which led to major changes in the Russian circus, starting with the management of the many circus buildings operating in Russia. In the process, the Bolshoi Circus passed under the management of the brothers Edgard and Askold Zapashny, who already owned a private (and extremely successful) circus company. The best known circus artists and managers in Russia, and the wealthiest to boot, the brothers Zapashny did not see the Bolshoi Circus as a mean to make more money: they have approached its management as a "patriotic" duty—the restoration of its primary position in the Russian circus world, and in the circus world in general. In 2011, they created the "Idol" World Festival of Circus Arts, which immediately became a major international circus festival, putting the Bolshoi Circus back on the international map. They also started a extensive program of renovation of the building and its aging machinery, and they brought their own creative talents to its productions, which have become more attuned to modern audiences. Thus the mighty Bolshoi Circus has entered a period of renewal.